I'm so excited to finally be able to share this quilt with you. 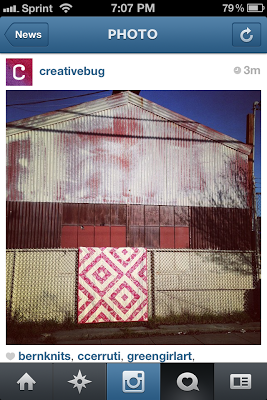 This is my Diamonds in the Sky pattern that I designed for Creativebug. 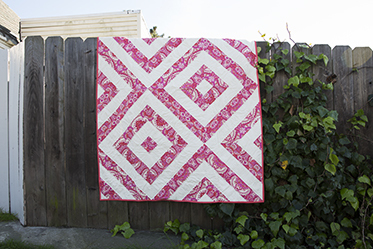 In my workshop I'll show you how to construct this quilt, step-by-step, from fabric cutting to finishing, and everything in between. I love this pattern because it's really visually striking and it's much easier to construct than it looks. 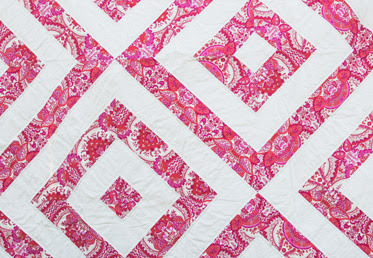 Even though this quilt makes such a strong visual impact, it's really simple to construct. I created this pattern to be beginner friendly, and it's strip pieced so the blocks come together pretty quickly. 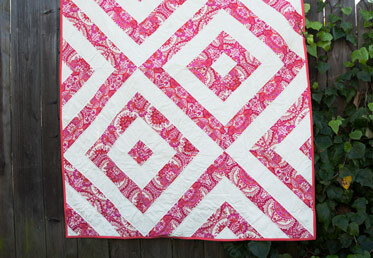 It also makes a fast project for more experienced quilters, as well. In my version of Diamonds in the Sky I used one print and one solid. The print is Amy Butler's Flora in Coral from her Alchemy Organic line, and the solid is FreeSpirit Designer Solids in Cream. I love how the design really allows the colors of the fabrics to pop. I think this would be a fun project to make with all solids too, which might not come as a surprise to you if you're familiar with my work. The quilt finishes at 60" x 80", so it's a nice size for a throw quilt, and it also works well on a twin sized bed. You can sign up for the individual workshop on Creativebug, or you can join as a member for a low monthly price to gain access to all of their amazing workshops. It's really such a great deal, and I love the fact that you can check out so much great content on your own schedule. And I leave with you my favorite photo of my Diamonds in the Sky. I love how the quilt looks on that fence in front of the industrial building. This was taken by my Creativebug friends on a photo shoot in San Francisco last month, and I think it's so great. I hope you enjoy the quilt, and the workshop, and I would love to see your versions of Diamonds in the Sky, too!